† Gen 10 is a chapter completely dedicated to a record of genealogies. There are a total of 70 clans and nations (Shem 26, Ham 30, Japheth 14). The total number is the product of two symbolically perfect numbers, 7 and 10. † As this chapter mentions the different languages (v.5,20,31) which did not exist until Babel, it should chronologically be located after Gen 11:9. Talmud is the collection of ancient Rabbinic writings consisting of two components: [a] the Mishnah (around AD 200), the first written compendium of Judaism’s Oral Law containing rabbinical elucidations, elaborations, and commentaries; and [b] the Gemara (around AD 500), a discussion of the Mishnah and related writings. Targum is the Aramaic translations or paraphrase of the Hebrew Bible, with explanations, in the 1st century. Josephus Flavius (AD 37-100) was a Jewish historian famous for his history books, especially Antiquities of the Jews (about AD 93). Herodotus (484-425 BC) was a Greek historian. He is often called “The Father of History” because of his famous book Histories about ancient Greece. 10:1 generations: a new “toledot” section (the 4th of 10 in Genesis). 10:2 The Japhethites recorded here include 7 sons (marked “(1)” in following table) and 7 grandsons (marked 2), a total of 14 clans and nations. These 14 groups were described to be residents of Asia Minor, the Mediterranean region and the islands and the European Continent. These are the Europeans and the ancestors of the white races. These nations belong to the Indo-European language group. After migration, they resided in Europe, North and South America, and Australia. Gomer: Cimmerians as recorded in Assyrian documents; located near Cappadocia in northern Turkey; mentioned in Eze 38:6.
o Jewish commentary: [a] Most probably the Celts (cf. Herodotus 2:33), the Franks, or the Gauls, all of whom were closely related. [b] Early sources translate this as Afrikey. This Afrikey, however, is not Africa, but Frikia or Phrygia. The Phrygians were an ancient nation who lived to the south of the Black Sea. They were originally known as Brigians. Linguistically, the Phrygians were related to the Armenians, but they may have also been related to the Franks, since there is a resemblance between the two names. Indeed, there are some ancient sources that identify Gomer with the Franks. Magog: located in northern Turkey; mentioned in Eze 38:2; 39:6.
o Jewish commentary: [a] Most probably a Teutonic people, living to the north of the Holy Land. [b] Some sources identify Magog with Germania. [c] Others identify them with the Goths. These were a Teutonic people who migrated to Scythia, in what is now southern Russia, north of the Black Sea. Ancient histories state that the Scythians came from Asia. Linguistically, the Scythians were related to the Iranians, and hence, to the Persians and the Medes. It is therefore significant that there was a Persian tribe known as the Germanians (Herodotus 1:125). Madai: Medians, a great nation, defeated the Babylonians with the Persians in 6th century BC; located in northern Iran; mentioned in 2Ki 17:6; Ezr 6:2; Es 1:3; Isa 21:2; Jer 25:25; Dan 8:20.
o Jewish commentary: [a] Ancestor of Medes (Josephus; Talmud). [b] An ancient source states that Madai is to the west of Gomer and Magog, on the shores and the islands. Javan: Ionians, a Greek tribe; located in western Turkey; later the name was used to refer to all Greeks (Exe 27:3; Dan 8:21; 10:20; Joel 3:6). o Jewish commentary: [a] Yawan in ancient Hebrew, also spelt Yavan; denoting Ionia (Josephus, Herodotus 7:94). [b] Other sources state that Yavan is Macedonia. [c] Others translate it as Ovisos, denoting Ephisus, an ancient Greek city in Lydia, founded by the Ionians around 1050 BC. An ancient source states that Yavan lived on the islands and the shore of Lydia, where indeed the Ionians lived. Tubal: also spelt Tuval; located north of Black Sea; mentioned in Isa 66:19; Eze 27:13.
o Jewish commentary: [a] A northern country (Eze 27:13; 38:2). This is usually identified with Bithynia. This is in the area to the east of the Bospherus. [b] Josephus says that the Tuvalites were the Ibers. Some say that these were the people of the Iberian Peninsula, and hence they were the original Spaniards. Indeed, one source says that this is why the Spanish refer to themselves as ‘people of Tuval’. [c] However, there was also an Iberian people who lived to the east of the Black Sea. Meshech: also spelt Meshekh; located southwest of Black Sea; Tubal and Meshech were allies and were often mentioned together (Eze 27:13; 32:26). o Jewish commentary: [a] A northern kingdom (Eze 27:13; 38:2; Ps 120:5). Most Talmudic sources identify Meshekh with Mysia. This was the land to the west of Bithynia, along the Dardanelles (Hellespont) and Marmara Sea (Herodotus 7:42,74). They might possibly be associated with Mycenae, an ancient city in Greece. [b] Josephus associates Meshekh with Cappadocia, whose capital is Mazaka, in what is now central Turkey (Herodotus 1:72). [c] Another possibility would be to identify Meshekh with the Massagatae, an ancient people who lived in Russia to the east of the Aral Sea (Herodotus 1:201). The name may be related to the Muskeva River, and hence to Moscow. Indeed, there are sources that say the Meshekh was the forerunner of the Slavs. Tiras: only appears in this chapter in OT; sea people. o Jewish commentary: [a] The Targum identifies this as Tarkey, which is identified as Thrace. Josephus likewise states that Tiras is Thrace. This is a people who lived in the Balkans, in what is now European Turkey and Bulgaria. Indeed, Turkey derives its name from Thrace. Linguistically Thracian is related to Albanian. There is also a possible relationship with the Etruscans. It is notable that there was a Tearus River going through Thrace (Herodotus 4:89). [b] In the Talmud, however, there is a dispute as to the identity of Tiras, with some saying that it is Thrace, while others say that it is Persia. The Persians, however, received their name from Perseus, whose kingdom was originally Tiryns (Herodotus 7:61). [c] Another ancient source identifies Tiras with the larger Mediterranean islands. 10:3 Ashkenaz: Scythians in the Assyrian documents; located among the Medianites in the 7th century BC; mentioned in Jer 51:27 (In modern times, Ashkenazi is the group name for Jews living in Europe.). o Jewish commentary: [a] This is a nation associated with the Ararat area (Jer 51:27). In Talmudic sources, it is rendered as Asia. In ancient times, Asia referred to western part of Asiatic Turkey, bordering on the Aegean Sea. [b] Josephus says that the Ashkenazites are the Reginians, on the tip of the Italian peninsula (cf. Herodotus 1:167). More logical, however, would be to associate the ‘Reginia’ of Josephus with Regnum Polemonis, to the south-east of the Black Sea, immediately in the Ararat area. By the 10th century, the term Ashkenaz was used to refer to Germany. [c] There are other sources that relate Ashkenaz to the Ashkuza mentioned in ancient writings, or to the Scythians. Riphath: located near the Black Sea. o Jewish commentary: [a] Josephus identifies these people with the Paphlagonians, an ancient people who lived on the Rifas River. [b] Other sources identify it with Parkvi, a country in Northern Ariana (in Persia). [c] Still others identify it with Hadiyv, a district in Assyria. Some identify these people with the Etruscans, who settled in Italy, Venice and France. Togarmah: located in the upper Euphrates, in eastern Turkey; mentioned in Eze 27:13-14; 38:3-6.
o Jewish commentary: [a] A northern people (Eze 27:14; 38:6). Josephus identifies these people with the Phrygians. [b] Other sources have Barberia, which some identify as Germania, Barbara, or Britannia. [c] There are other sources that identify Togarmah with the Armenians or Turks. 10:4 Elishah: Alasiyans, located on the island of Crete; mentioned in Eze 27:7.
o Jewish commentary: [a] This is seen as an island (Eze 27:7). Josephus identifies it with the Aeolians (Antiquities 1:6:1), who were known to have inhabited the island of Lesbos (Herodotus 1:151). [b] Others identify it with Sicily. Targum renders it Italia. [c] Others identify this Talmudic source with Hellas, since the Greeks called themselves Hellas or Ellis. This was indeed an ancient appelation for a Greek tribe. It may also be associated with the Halys River, which separated the Greek-dominated area from the Asiatic. The name Helles is also found in the Hellespont, the channel that currently separates Europe from Asia (the modern Dardanelles). Tarshish: Carthagians in northern Africa; mentioned in 1Ki 10:22; Isa 2:16; some believe it refers to Spain. o Jewish commentary: [a] Tarshishah (1Ch 1:7). It was famed for its ships (1Ki 10:22; 22:49; Isa 23;10; 66:19; Eze 38:13; Jonah 1:3). [b] Josephus ant Talmud identifies it with Cilicia, whose capital was Tarsus. [c] Some associate it with Tuscany, Lombardi, Florence and Milan. Kittim: (plural form representing people group) located in southern coast of Cyprus; mentioned in Nu 24:24; Isa 23:1.
o Jewish commentary: [a] An island people (Jer 2:10; Eze 27:6; Nu 24:24; Isa 23:1,12; Dan 11:30). Josephus identifies it with Cyprus, whose main city was Citius. [b] The Targum identifies it with Italy, and hence, the source of the Italian and Romans. Dodanim: (plural form representing people group) possibly located in Cyprus; another possibility is the people in Rhodes, islands along the Turkish southwestern coast. o Jewish commentary: [a] Rodanim (1Ch 1:7). The Dodonians were known to be an ancient people (cf. Iliad 2:748; Herodotus 2:52-57). [b] The Targum renders it as Dardania, a city on the Dardanelles. The Targum also adds Ridos, Chamen and Antioch. Ridos is identified with Rhodes. [c] Others identify the Dodanim with the Bohemians. 10:5 the coastland peoples: a suitable description of the long coastlines of Mediterranean lands, absent from the descriptions for the descendants of Ham and Shem. o Jewish translation: isolated nations, islands. spread: a main theme in this chapter, the result of God’s action in Gen 11:9.
lands…languages…clans…nations: These are the 4 dividing factors: divisions according to physical location (literal: territories), communication, culture, and government. o The Israelites were organized into tribes, clans, families, individuals (Jos 7:14). The record for the Japhethites is the shortest among the three, possibly because they lived further from the Israelites and had little contact with them. 10:6 The Hamites recorded here include 4 sons (marked “(1)” in following table), 8 grandsons (2), 2 great-grandsons (3), 7 races (8), and 9 nations (9), a total of 30 clans and nations. These 30 groups were described to be residents of northern Africa and the Middle East, including Palestine, Arabian Peninsula, and Mesopotamia. These are the Africans and the ancestors of the black races. These nations belong to the African language group. After migration, they occupy most of the continent of Africa while some migrated to the Indian Subcontinent. Cush: possibly the Cassites; located south of Egypt, in northern Sudan and Ethiopia; mentioned in Eze 11:11.
o Jewish commentary: [a] Usually translated as Ethiopia (Gen 2:13, Josephus). [b] There was also an ancient city of Kish 8 miles east of Babylon. [c] Other ancient sources also indicate that it was to the east of the Holy Land. [d] The Targum renders it as Arabia. This, however, may also have referred to an area in Africa on the upper Nile. Egypt: (Heb. Mizraim) same as Egypt; Mizraim is a dual noun referring to Upper and Lower Egypt. o Jewish translation: Mitzraim is the Hebrew name for Egypt. Put: same as Libya; mentioned in Nah 3:9 as the ally of Egypt. o Jewish commentary: [a] Josephus identifies it with Lybyos or Lybia in North Africa (Jer 46:9; Eze 27:10; 38:5; Nah 3:9). In Coptic (ancient Egyptian), Lybia is also known as Phiait. [b] The Targum, however, renders it as Alichrok, possibly Heracleotes. [c] Other ancient sources state that it is to the east of the Holy Land (Yov’loth 9:1). Canaan: located in Palestine, including Phoenicia, ruled by the Egyptians in 15th to 13th century BC. o Jewish commentary: Aborigine tribe of the Holy Land. See Gen 10:15-19. 10:7 Seba: located in the Arabian Peninsula; major ancient commercial centre; mentioned in Ps 72:10; Isa 43:3; 45:14.
o Jewish commentary: [a] Josephus identifies this with the Sabeans, a people living in southern Arabia (Isa 43:3; 45:14; Ps 72:10). The name may still be preserved in the town of As Sabya. [b] Talmud, this nation is identified with Sakistan or Sagistan, a district in Drangonia in the Persian Empire, occupied by Scythians. Havilah: located in the Arabian Peninsula; mentioned in Gen 25:18.
o Jewish commentary: [a] The Targum has India. [b] Josephus, however, has Getuli. Sabtah: located in the Arabian Peninsula; another possibility is Ethiopia. o Jewish commentary: [a] Josephus identifies this nation with the Astaborans. [b] The Talmud identifies it with outer Takistan. [c] The Targum identified a Cushite tribe, possibly the Sabrata of North Africa. Raamah: located in southwest Saudi Arablia; major ancient commercial centre; mentioned in Eze 27:22.
o Jewish commentary: [a] They were traders in spices, precious stones and gold (Eze 27:22). The Targum has Lubai, the Lybians. [b] It can also be Mauretania, a district in northwest Africa. Sabteca: located north of Yemen on the Arabian Peninsula; another possibility is Ethiopia. o Jewish commentary: The Targum renders it Zingain, possibly the African Zeugis. Sheba: located in southwest Arabian Peninsula; producing gold and incense (Ps 72:15; Isa 60:6); queen of Sheba visited Solomon (1Ki 10:1). o Jewish commentary: [a] Josephus identifies these with the Sabeans (1 Ki 10:1; Gen 10:28; 25:3). [b] The Targum renders it Zamdugad or Dmargad. Dedan: located in oases of the Arabian Peninsula; major ancient commercial centre (Eze 27:20; 38:13); mentioned in Isa 21:13; Jer 49:8; 25:23; note that Sheba and Dedan were also the names of Abraham’s grandsons (Gen 25:3; 1Ch 1:32). o Jewish commentary: [a] Josephus identifies this nation with the Judadeans of western Ethiopia. [b] The Targum has M’zag, perhaps the Mazices of northern Africa. 10:8 Cush fathered Nimrod: Nimrod, a grandson of Ham, was a special case. He was not included in the list in v.7 for the sons of Cush. However, his description is the most extensive of any person in this chapter because of his many conquests (v.8-12). He founded prominent cities through aggressive force, not gradual diffusion of people as shown elsewhere in this chapter. His name means “rebel”. Some consider him the founder of the great godless Babylonian empire. o Jewish commentary: See Micah 5:5. Nimrod is credited as being the first Babylonian king and the builder of the Tower (Gen 11:1-9). In this chapter, there are 2 different terms to record the names of the sons: “sons of…” or “fathered…”, the former used when the emphasis is on the father, the latter used when the emphasis is on the son (such as the case of Nimrod in v.8). mighty man: a warrior excelling at battles. 10:9 before the Lord: an idiom meaning excelling in his work of hunting. However, some interpret this positively to mean God’s favour while others interpret this negatively to mean sinful rebellion as in the thought of Ps 66:7 where God watches the nations to stop the rebellious rise up against Him. 10:10 beginning of his kingdom: Nimrod’s conquest began from central Mesopotamia; possibly the first kingdom in the world. Babel: ancient Babylon; near the narrowest part between Tigris and Euphrates rivers; 80 km south of Baghdad; the name Babylon may be traced to the Akkadian babilu, meaning “gate of God”. o Jewish commentary: Hebrew for Babylonia or Babylon. Erech: later called Uruk, today called Warka; southwest of Baghdad, 40 km from Ur, the ancient hometown of Abraham; mentioned in Ezr 4:9-10; may be the origin for the name Iraq. o Jewish commentary: This was a city near Ur, on the lower Euphrates River (Ezr 4:9). Accad: locate in northern Babylon; famous ancient city under King Sargon of Akkad (2350-2295 BC). o Jewish commentary: This was the capital of northern Babylonia. The exact site of the city is unknown, although it was near Sippar, and about 30 miles north of Babylon. The Targum renders this as Netzivim, a city in the northeast end of Mesopotamia. Calneh: possibly in southern Babylon. o Jewish commentary: The Talmud identifies this the modern Niffer, midway between Erekh and Babylon on the Euphrates River. Other sources identify it with Ctesphon, a city on the eastern bank of the Tigris. land of Shinar: the land with the above 4 cities including Babel (Gen 11:2); also called Babylonia (Isa 11:11; Dan 1:2). o Jewish commentary: Usually identified with Sumer. The Targum calls it the land of Pontus, the ‘land of the sea,’ that is the land toward the Persian Gulf. 10:11 built: Nimrod’s origin from Babel and his construction of cities is related to the theme of building a city at Babel in the next chapter (Gen 11:4-5,8). Assyria: different from the Assyrian Kingdom; west of Tigris River; mentioned in Mic 5:5.
o Jewish commentary: (Hebrew Asshur) See Genesis 10:22. It also denotes a city on the Tigris River, some 50 miles south of Nineveh. Nineveh: capital of the Assyrian Kingdom in 8th century BC; mentioned as a large city with great wickedness (Jonah 1:2; 3:3; 4:11); located in northern Iraq, east of upper Tigris River, opposite the town of Mosul. o Jewish commentary: The ancient capital of Assyria, on the Tigris River (Jonah 1:2; 2Ki 19:36). Rehoboth-Ir: the 2 words mean “open land” and “city”, possibly referring to the land adjacent to Nineveh; present-day Mosul. o Jewish commentary: Literally ‘broad places of the city,’ or ‘avenues of the city.’ The Talmud says that it is Euphrates of Mishan. Meshan or Mesene is the island formed by Euphrates, the Tigris and the Royal Canal. The Targum, however, translates it, ‘avenues of the city.’ Thus, it would not be a place name, but would denote the fact that Asshur built Nineveh as a city with avenues. Calah: city 30 km northwest of Nineveh. o Jewish commentary: This is a city a few miles south of Nineveh. Its modern name is Nimrud! The Talmud states that it is ‘Borsof on the Euphrates’. This is Borsif or Borsippa, some 20 miles south of Babylon on the Euphrates. It is, however, a long distance from Nineveh. 10:12 Resen: city 13 km northwest of Nineveh. o Jewish commentary: The Talmud identifies Resen with Aktispon or Ctesphon. The Targum renders it Talsar or Talasar (Isa 37:12; 2Ki 19:12). The people in Nimrod’s empire, Assyrians and Babylonians, eventually became main enemies of the Israelites and conquered the two Israeli kingdoms. While some people believe that Nimrod was a cruel dictator, there is no indication in the Bible on his character. However, his origin from Babel and his construction of cities were probably included so as to put him in a negative light. Historians variously linked Nimrod’s identity with the names of Tukulti-Ninurta (Assyrian king in 1246-1206 BC), Sargon (king of Akkad, 2350-2295 BC), Sargon’s son Naram-Sin, Amenhotep III (Egyptian pharaoh in 14th century BC), Hamurabi (Babylon emperor in 1820-1750 BC). 10:13 The next 7 names refer to the races, not individuals (suffix “–im” means sons of, implying the tribe or nation; similar to endings of “–ite”). Ludim: located in the western part of the Nile delta. o Jewish commentary: [a] The Targum renders this Givatai, related to the name Gipt or Egypt, and also to the word Coptic, which denotes the ancient language of Egypt. [b] Josephus, however, states that all the nations in this verse are unidentifiable. Anamim: may mean the Libyan desert, or west of Alexandria. o Jewish commentary: The Targum renders this Martiorti or Mariotai. These are the people of Mareotis, a district in lower Egypt containing the town of Marea. Lehabim: Libyans, west of Egypt. o Jewish commentary: Literally ‘fire people,’ since their faces are like fire. The Targum translates this name as Livvakai or Livkai, possibly a Lybian tribe. Josephus states that they are Lybians. Naphtuhim: located in central Egypt. o Jewish commentary: The Targum translates this as Pontsikhnai, a district in Egypt. 10:14 Pathrusim: located in southern Egypt. o Jewish commentary: See Isa 11:11; Jer 44:1,15; Eze 29:14; 30:14. The Targum translates it as Nasyotai or Gasyotai, the district surrounding east of Pelusium in Egypt. Casluhim: originally located in northern Egypt; became the Philistines who occupied the southwest coastal areas of Palestine. They were credited with giving their name to the land of “Palestine”. They continued to be a thorn in the flesh of the Israelites for many centuries. o Jewish commentary: The Targum renders this as Pentpoletai, an Egyptian district. In the Midrash it is identified with Sa’id on the upper Nile. Philistines: (Heb. Pelishtim) These people lived on the Mediterranean shore between Palestine and Egypt. Caphtorim: originally located in the island of Crete. The Hebrew MS manuscript linked the Philistines with Casluhim but some changed the order of words and linked the Philistines with Caphtorim, mainly because Jer 47:4 and Am 9:7 linked the Philistines with Caphtor. On the other hand, Dt 2:23 and 1Ch 1:12 describes the people from Caphtor as Caphtorites. Some Bible scholars proposed that Casluhites, originally located in the delta areas of the Nile, moved to Crete and later to southwest Palestine and became the Philistines. Therefore, Casluhites were perhaps ancestors of Caphtorites who formed a new group after mixing with the native people in Crete. 10:15 Canaan had at least 2 sons: Sidon and Heth. The other 9 names refer to races. They could either come from the 2 sons or could be other sons of Canaan. Here the descendants of Canaan appeared to be numerous and rich, yet Canaan was under a curse. Sidon: located in northwest Palestine; Sidon was the most ancient coastal city of Phoenicia, often linked with Tyre (Isa 23:4; Eze 28:20); Sidon was sometimes used as the name for the Phoenicians (Num 18:7; 1Ki 5:20). o Jewish commentary: [a] located to the north of the Holy Land (Gen 10:19). This was the capital of Phoenicia. [b] However, according to the Targum, Canaan’s first-born was Bothnias (or Cothnias), who was the founder of Sidon. Heth: ancestor of the great Hittite Empire between 16th and 8th century BC; located in the hilly region of Palestine (Gen 15:20; 23:5); Esau married a Hittite woman (Gen 26:34-35; 27:46); Assyrians called Canaan as “land of the Hittites”. o Jewish commentary: father of the Hittites, one of the tribes living in the Holy Land (Gen 15:20). They lived to the west of the Dead Sea around Hebron (Gen 23:5). Both the Hittites and Amorites were associated with the Jerusalem area (Eze 16:3,45). 10:16 Jebusites: located near Jerusalem (1Sa 15:8; 2Ki 5:6). o Jewish commentary: Jebus is identified with Jerusalem (Jdg 1:21; 19:10; 1Ch 11:4; Jos 15:63). The Jebusites therefore lived in the Jerusalem area. Later, however, this area was settled by the Hittites. Amorites: located in Canaan (Jos 10:5; 11:3); mentioned in Gen 48:22.
o Jewish commentary: A people who originally lived on the west of the Dead Sea, but were driven out (Gen 14:7). They lived around Hebron, where they allied with Abraham (Gen 14:13). They also lived around Shechem (Gen 48:22). Later, they settled the land on the east bank along the Arnon River, near Moab (Nu 21:13). They also lived in Gilead (Nu 32:39). They later invaded the Holy Land again (Jdg 1:34). Girgashites: located in Canaan (Dt 7:1; Jos 3:10). o Jewish commentary: Inhabitants of the Holy Land (Gen 15:21). According to tradition, they left the Holy Land before the Israelite invasion and settled in Africa. 10:17 Hivites: located in the northern hilly region of Palestine (Jos 11:3; Jdg 3:3), from Shechem north to Lebanon. o Jewish commentary: They lived in the central part of the Holy Land near Shechem (Gen 34:2). They also lived in Gibeon, and survived the conquest of the Holy Land (Jos 9:3,7, 11:19). They lived in the north, near Mount Lebanon, from Hermon to Chamath (Jdg 3:3). Some identify them with the people of Tripoli. The Midrash apparently notes that they were cave. Arkites: located north of Sidon. o Jewish commentary: They are identified as the residents of Arce, a city at the northwest foot of Mount Lebanon (Josephus). Sinites: possibly north of Sidon. o Jewish commentary: This is most probably associated with the city of Orhosia, a Phoenician seaport, south of the Eleutheros River. Other sources identify the Sinites with the Kafruseans. 10:18 Arvadites: located in northern Lebanon. o Jewish commentary: [a] These are identified as the inhabitants of the island of Aradus on the Phoenician coast (Josephus). [b] Others identify them with the town of Antridanai, a town opposite the island of Arados. [c] Another source identifies them with the Lutsai, probably the inhabitants of Arethusia, between Epiphania and Emasa. Zemarites: located on the Mediterranean coast of Syria, possibly modern Sumra. o Jewish commentary: Literally ‘wool people,’ possibly because they sold or worked with wool. Talmud renders their area as Chametz, a city of Syria on the eastern bank of the Orontes River. Hamathites: located in northernmost Palestine (Num 34:8; Jos 13:5), modern Hama; mentioned in 2Ki 14:28; 18:34; Isa 38:13.
o Jewish commentary: This is to the north near Mount Hermon (Jdg 3:3; Nu 13:21; 34:8; Am 6:14; Eze 47:17). It is also identified with Antioch. 10:19 in the direction of Gerar: Canaanites extended from Sidon in the north to Gerar located in the extreme southeast of Palestine (Gen 20:1; 26:6). Gaza was the most wellknown city in southern Palestine (Num 6:4; 1Sa 6:17), located northwest of Gerar. o Jewish commentary: Capital of the Philistine nation, toward the south of the Holy Land, near the coast (Gen 20:1; 26:1). Gaza: City on the south of Holy Land along the Mediterranean shore. Sodom, Gomorrah, Admah, Zeboiim, Lasha: cities near the Dead Sea (Gen 14:2), closely related to the Israeli patriarchs (Gen 14, 20, 21, 26). o Jewish commentary: These first four cities were in what is now the southern end of the Dead Sea (Gen 14:2-3). They were destroyed by God for their wickedness (Gen 19:24-25). These cities formed the southeast border of the Canaanite territory. Lasha is identified with modern Callirohoe, a resort city on the eastern shore of the Dead Sea. 10:20 The record for the Hamites is the longest in this chapter, mainly because they were the main adversaries to the Israelites. 10:21 The Shemites recorded here include 5 sons (marked “(1)” in following table), 5 grandsons (2), 16 later descendants (3,4,5), a total of 26 clans and nations. These 26 groups were described to be residents of the Middle East and lived in the same regions as the some of the Hamites, including Palestine, Arabian Peninsula, and Mesopotamia. These are the Asians and the ancestors of the yellow races. Many of these nations belong to the Semitic language group. After migration, they resided in the continent of Asia and northern Africa. Some of the early Shemites were thought to have migrated across the Berling Strait and settled in North America. They became the American aborigines and the ancient peoples in Central America (Aztecs, Mayans, Incas, etc.). children of Eber: Jewish translation: Hebrews (see Gen 10:24; 11:14). o Eber gave his name to the later Israelites (Gen 14:13; 39:14; 41:12; Ex 2:11). However, the etymology of “Hebrew” remains disputed. The term “Israelites” is used much more often and the term “Hebrew” occurs usually to distinguish the Hebrew people from foreigners (Gen 43:32; Ex 2:6; 1Sa 4:6-9). Josephus described Canaan as the “land of the Hebrews” (Gen 40:15) and God identified Himself to Moses at the burning bush as the “God of the Hebrews” (Ex 3:18). elder brother of Japheth: Shem is clearly identified as Noah’s eldest son. This is found in most English versions of the Bible and is supported by most Biblical scholars. However, Jewish tradition and some versions (NIV, KJV) identify Japheth as the eldest son of Noah (NIV: “Shem, whose older brother was Japheth”). 10:22 Elam: located in southeast Babylon, present-day southwest Iran; Israelites were exiled to Elam by the Assyrians (Ezr 4:9. Isa 11:11). o Jewish commentary: [a] See Gen 14:19. It is associated with Media (Isa 21:2; Jer 25:25). Josephus writes that Elam was the ancestor of the Persians. It is thus described as the territory between Shushan and Media. [b] Other sources identify it with the area between the Tigris and India. Asshur: located east of Tigris (Gen 25:3; 2Sa 2:9); another possibility is the race in Sinai Peninsula (Num 24:22). o Jewish commentary: Identified with Assyria (Josephus, Gen 2:14; 10:11). Their territory was basically east of the Tigris. Arpachshad: (2nd generation after Shem, ancestor of Abraham) located in Babylon, descendants mentioned in Gen 11:12-17.
o Jewish commentary: He was the ancestor of Abraham (Gen 11:10). Josephus states that he was the ancestor of the Chaldeans, who lived on the lower Euphrates. In Hebrew, the Chaldeans were known as Casdim. They lived near the Persian Gulf. The Targum translates the name as Arphasdai. Lud: located in upper Tigris. o Jewish commentary: Josephus identifies this with Lydia, south of the Black Sea (Herodotus 7:74). Aram: nomads in Mesopotamia and Syria. Abraham sought a wife for his son from Aram (Gen 24:10; 25:20); Rebekah and Laban (Jacob’s father-in-law) were Arameans. o Jewish commentary: Ancestor of Aramaea (from where the language Aramaic comes), to the northeast of the Holy Land, approximately where Syria is now. Josephus states that the Greeks called the Aramaeans Syrians. Its capital was Damascus (Isa 7:8). It also included the area between the Tigris and Euphrates rivers. Laban was thus called an Aramaean (Gen 22:20; 24:4; Dt 26:5). Aram was important because of its association with Abraham’s family. 10:23 Uz: may not be the Uz in Job 1:1; possibly located near Damascus, according to Josephus. o Jewish commentary: Josephus writes that Utz founded the cities of Trachnitis and Damascus, and settled the lands between the Holy Land and Celesyria (Antiquities 1:6:4) (Jer 25:20; Job 1:1). Other sources identify Utz with Armatyai, which is most probably the modern Armannia (Romania, near Constantinople). o Jewish commentary: Josephus states that Hul founded Armenia, a land to the south of the eastern Black Sea. See Herodotus 7:73.
o Jewish commentary: According to Josephus, the founder of the Bactrian nation. Mash: possibly in the mountains of Lebanon. o Jewish commentary: Meshekh in 1Ch 1:17. Josephus identifies it with Charax Spanisi. Other sources state that it is the land in the area of Mount Mash in Mesopotamia, north of Netzivim. 10:24 Shelah: (3rd after Shem, ancestor of Abraham); descendants ruled Moab (1Ch 4:21-23). Eber: (4th after Shem, ancestor of Abraham); great-grandson of Shem, but was mentioned first amongst Shem’s descendants in v.21; the name Eber has been associated with the word Hebrew (possibly because he was a religious and pious person in the time of general apostasy; although Hebrew is later used only for Abraham’s descendant, Gen 14:13); the meaning of the name is “region across”, related to the crossing of the Euphrates by Abraham on his way to Canaan (Gen 15:18; Num 24:24). o Jewish commentary: Ancestor of the Hebrews. 10:25 Peleg: (5th after Shem, ancestor of Abraham); the name means “division”. in his days the earth was divided: probably pointing to the Tower of Babel (a rabbinic tradition); his descendants were recorded in ch.11, probably indicating that they were born after Babel. o Jewish commentary: This refers to the split occurring after the destruction of the Tower of Babel (see Gen 11:8). This took place in the year that Peleg died. Joktan: the name means “small” or “young”. Nomads in Arabia took Joktan as their common ancestor. He had 13 sons (v.26-29), all living in southern Arabian Peninsula. o Jewish commentary: Josephus states that he and his children lived near the Cophon River in India. In Arabian traditions, he is Kochton, the founder of Yemen. 10:26 Almodad: in southern Arabia. o Jewish commentary: Some identify him with the founder of Morad in Yemen. o Jewish commentary: Possibly Shalepynoi mentioned by Ptolemy’s Geography. o Jewish commentary: Literally, ‘courtyard of death.’ Some identify this with Hadarmaveth in southern Arabia. Jerah: possibly in southern Arabia. o Jewish commentary: To the west of Hadarmaveth, there is a Mount Varach. 10:27 Hadoram: possibly modern Dauramn in Yemen. o Jewish commentary: Some interpret this as denoting ‘the south.’ This was a fortress to the south of Sana. See 1Ch 18:10; Zec 12:11. Uzal: in Yemen, possibly modern Sanaa, capital of Yemen. o Jewish commentary: This was the ancient Arabic name for Sana, the capital of Yemen. Diklah: likely an oasis in southern Arabia. o Jewish commentary: Literally a palm tree. Some say that it is an area in Mina, abundant in palm trees. 10:28 Obal: in Yemen, possibly in the highlands. o Jewish commentary: Some identify this with Avalitae on the Ethiopian Coast. o Jewish commentary: Literally ‘Father of Mael.’ Some identify this with the Mali, a tribe living in the Mecca area. Sheba: same name as a descendant of Ham (v.7); the queen of Sheba could come from one of these two Shebas (1Ki 10:1); it is also possible that the people in Sheba were from intermarriages of Shem’s and Ham’s descendants (see example in 1Ch 2:52-54). 10:29 Ophir: in southwestern Arabia; producing gold (1Ki 9:26-28; 1Ch 29:4); much of the gold overlay of the Temple of Solomon came from Ophir. o Jewish commentary: The place from which King Solomon brought gold (1Ki 9:28; 10:11; Ps 45:9; Isa 13:12). [a] From the context, it is a place on the Arabian peninsula. Some identify it with El Ophir, a town in Oman. [b] Josephus, however, identifies Ophir with Aurea Chersonesus, belonging to India (Antiquities 8:6:4). The Septuagint translates Ophir as Sophia, which is Coptic for India. There was indeed an ancient city known as Soupara or Ouppara in the vicinity of Goa on the western coast of India. [c] Later authors identified Ophir with the New World. o Jewish commentary: Some identify this with Chavlotai, an area on the Persian Gulf. This is Huvaila in Bahrein. Others state that it is Avalitae on the Avalite Bay (now Zeila), a city on the Sea of Adan south of Bab el Mandeb. There is also a Nagar Havili in India, on the Arabian Sea, some 80 miles north of Bombay. There is also a town Chwala on the Caspian Sea; the Caspian Sea is called Chwalinskoje More in Russian. The name Havilah in the Torah may refer to more than one place. o Jewish commentary: This is identified as Yovevitai or Yoveritai mentioned by Ptolemy, along the Salachitis Gulf (Gulf of Oman). 10:30 Mesha: at the westernmost boundary of Joktan’s descendants, possibly in northern Arabia. o Jewish commentary: This is identified with Mecca. Others say that it is Mocha in Yemen. Others identify it with Mesene at the mouth of the Tigris, where it flows into the Persian Gulf. Sephar: possibly in southern Arabia. o Jewish commentary: Some sources identify this with Medina. The Midrash states that it is T’phari or Taphar. Others identify it with Isfor in southern Arabia. hill country of the east: Some identify this with Alakdar in eastern Arabia, on the Indian Ocean. 10:31 The record for the Shemites should by necessity be the longest because they included God’s chosen people. While it is not as long as the Hamites in this chapter, the Shemite genealogy continues in Gen 11:10-26. 10:32 sons of Noah: recapitulation, corresponding to v.1. genealogies…nations: Notice that there is no mention about “languages”. This last verse refers to the clans of the sons of Noah when there was not yet any differentiation by language. o Jewish commentary: There are 70 nations mentioned in this chapter. These are the 70 nations or 70 languages often mentioned in Talmudic literature. The number “70” is a multiple of “7” and “10”, both numbers symbolizing completeness. The 70 nations therefore are representative of the totality of all peoples. Question: Can we classify human beings into different races? In the last 20 years, talking about race becomes a taboo in the present social atmosphere of political correctness. Many people object even the simple division of people into races, let alone talking about comparative differences between races. Yet, objectively, race is a fact. For the majority of people we meet, the race can be easily determined by visible physical appearance. Trying to avoid the subject of race in the name of political correctness is unnecessary. Objective truth must be recognized. o What is political correctness? The origin of political correctness is to avoid insulting or embarassing people. It is a noble objective that all human interaction should adopt. However, modern political correctness has become a radical tyranny by suppressing truth in the name of political correctness. For example, in the name of tolerance, sin is no longer called sin. In the name of pluralism or diversity, all religions are treated as equal. Christians must avoid this irrational tendencies and insist that truth is a higher priority than political correctness. We are not required to be politically correct in the presentation of truth. Human groups do vary strikingly in a few highly visible characteristics, such as skin color, eye shape, hair type, body and facial form—in short, the traits that often allow us to determine a person’s origin at a single glance. But there are more differences between races than appearance alone. Races are recognized by a combination of geographic, ecological, and morphological factors and gene frequencies of biochemical components. o In biology, race is a sub-species. It is defined as: [a] a local geographic group distinguished by genetically transmitted physical characteristics, or [b] a group of people classified together on the basis of common history, nationality, or geographic distribution. o Ethnicity is a related but different concept. It usually refers to the membership in a group defined by a shared geographical origin or cultural history, including common language, religion, art, and other cultural factors. Traditionally, anthropologists classify people in the world into 3 broad races: Mongoloids (yellow people), Negroids (black people), and Caucasoids (white people). o Some classify into 5 races: Yellows (East Asians), Reds (Native Americans), Whites (Europeans), Browns (Australoids, Southeast Asians), and Blacks (Africans). A wellknown anthropologist Luca Cavalli-Sforza documented the genetic distances among 15 sample populations, 3 per continent, calculated from 5 blood group systems: Africans, Oceanians (aborigines in Pacific islands and Australia), East Asians (Orientals), Europeans, Americans (Indians in North and South America). Africans are most different from all others. Oceanians are furthest from Africans and are also different from the other three. The other 3 groups (East Asians, Europeans, Americans) are closest to each other, with Americans being in the middle. While the differences are statistically significant, Cavalli-Sforza argued that different racial groups were originally from the same origin and the differences occurred only after groups of people migrated. Counter argument: Different races may come originally from one group but the present differences are sufficient to justify the description of races. For example, the English language is originated from German and French, but we cannot use this reason to conclude that English, German, and French are all ONE language. Since the 1970s, some anthropologists have proposed that races, as distinct biologically or genetically homogeneous groups of humans, are an artificial concept not justified by reality. Biologists have attempted to show that only a small proportion (6% or less) of human genetic variability occurs between races. [It should be noted that human DNA is only 13% different from the chimpanzee and only 25% different from the nematode worm.] This is part of the campaign for political correctness which truth-believing Christians should not support. The case against using the concept of race is based on: [a] There is much genetic variation within each race, but less variation between races. Counter argument: This is a statistical trick, comparing the differences between individuals within the group to the average values of different groups. [b] There are no “pure” races because of increasing intermarriages among races. [c] Different races are still potentially interfertile (intermmariages can produce children). On the other hand, a wellknown psychologist Philippe Rushton (1994) used empirical research to show significant differences among races. He classified human populations along traditional lines—people of east Asian ancestry (Mongoloids, Orientals), people of African ancestry (Negroids, blacks) and people of European ancestry (Caucasoids, whites). He found that these classifications have much predictive and explanatory power. On more than 60 variables—such as brain size, intelligence, reproductive behaviour, aggressiveness, life span, etc.—Mongoloids and Negroids define opposite ends of a spectrum, with Caucasoids falling intermediately. He also admitted that there is much variability within each group. Rushton, a professor at the University of Western Ontario at London (Ontario), was strongly criticized by some people for crossing the line of political correctness by probing into racial differences. However, his research is widely recognized for its high quality and his works have been published in many international peer-reviewed journals. Population censuses in the US and Canada still collect data on race. † There were many great heroes in history, perhaps wellknown in the whole world at their times. Their great deeds have all been buried in history. Few of them are even mentioned today. Yet, service for God will be recorded in God’s records and will be forever remembered. 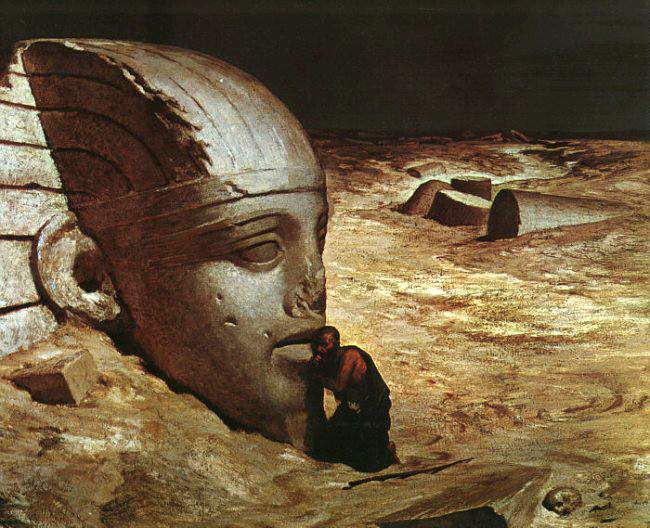 † A nice poem Ozymandias (1818) by P.B. Shelley reminds us the transient nature of man. Nimrod (v.8) may be the greatest man in his time. Now, none of his works remains.